In this frozen area of extraordinary beauty, powerful orcas and leopard seals patrol the waters, while ethereal snow petrels grace the skies against a backdrop of bristling mountain ranges and surreal icebergs. Threading our way through an intricate system of icy waterways, we aim for the glorious Crystal Sound at the mouth of The Gullet. Get ready for an exciting Antarctic adventure, complemented by powerful whales, shimmering mountain ranges and mesmerising icebergs. Arrive in Ushuaia, renowned for its exquisite chocolates and breath-taking scenery. You will be met on arrival and transferred to your downtown hotel. The rest of the day is at your leisure. After checking out of your hotel in the morning, you will have time to explore Ushuaia before boarding the MV Greg Mortimer mid-afternoon. You will have plenty of time to settle into your cabin, before an early evening departure down the Beagle Channel. We head southbound towards the Antarctic Peninsula and across the Drake Passage. Join our Polar experts to learn about Antarctica's unique wildlife and history, talk to fellow passengers, staff and crew, and prepare for your landings with the environmental and safety briefings given on board. Spirits soar as air and water temperatures fall, marking our crossing into the 'White Continent.' Possible landings as we approach the South Shetland Islands include Aitcho, Robert or Deception Islands. An overnight passage along Gerlache Strait delivers us to the stunning Antarctic Peninsula, an ethereal wonderland of vast proportions. Aboard robust Zodiacs, we explore penguin rookeries, historic sites and scientific stations, and cruise up close to intricately shaped icebergs and seals basking on ice floes. Kayakers paddle through narrow waterways, in search of wildlife and serenity. Stepping ashore on the continent itself creates an everlasting memory. Bubble-netting humpbacks deserve a wake-up call, even at midnight! A curious leopard seal cruising amongst spectacular icebergs may mean postponing lunch. Over the next seven days, a host of choices are open to us and depending on ice and weather conditions, the western side of the Antarctic Peninsula is ours to explore. Our experienced expedition team, who have made countless journeys to this area, will use their expertise to design our voyage from day to day. This allows us to make the best use of the prevailing weather, ice conditions and wildlife opportunities. Because we are so far south, we will experience approximately 18-20 hours of daylight and the days can be as busy as you wish. We will generally make landings or Zodiac excursions two, and occasionally three, times a day; cruising along spectacular ice cliffs, following whales that are feeding near the surface, and landing on the continent and its off-shore islands to visit penguin rookeries, seal haul outs, historic huts, and a few of our other favourite spots along the peninsula. There will be plenty of time for sleep when you get home! Aboard robust Zodiacs, we explore penguin rookeries, historic sites and scientific stations and cruise up close to intricately shaped icebergs. We will see seals basking on ice floes and stepping ashore on the continent itself, will no doubt create an everlasting memory. A curious leopard seal cruising amongst spectacular icebergs, may mean postponing lunch, or seeing Bubble-netting humpbacks will deserve a wake-up call, even at midnight! Such wildlife opportunities may present themselves and your crew will ensure that these fortunate sightings are not wasted. There will be plenty of time to enjoy the sheer beauty and breathtaking scenery of this magical land, with it's impressive glaciers and rugged snow-capped mountains. You will have plenty of time to walk on shore amongst the hundreds of penguins, or to enjoy a Zodiac cruise and simply enjoy this wonderful landscape. The Peninsula has a remarkable history and during the voyage, we will learn more about the incredible expeditions to these remote areas and hopefully, you will enjoy the same sense of excitement as many of those early Explorers. A protected bay surrounded by magnificent peaks and breath-taking glaciers, the rocky cliffs provide a perfect nesting site for blue-eyed shags, terns and gulls. Paradise Harbour is also a haven for whales as we keep our eyes open for humpbacks, orcas and minkes, as well as crabeater seals, whilst we explore the bay in Zodiacs. This wildlife-rich island is tucked into a neat bay at the eastern end of Livingston Island. On a clear day, the glaciers and mountains of Livingston Island dominate the vista. There is a large chinstrap penguin rookery tucked in between basaltic turrets, coloured by yellow and orange lichens. Gulls nest on these turrets and there are often fur seals and elephant seals hauled out on the pebble beaches. At one extremity of the island, there is a large colony of nesting blue-eyed shags. At the other end lies a small Argentine station that is sometimes occupied by scientists conducting research on the penguin colony and surrounding waterways. If ice conditions allow, standing on the bow of the Greg Mortimer quietly moving through the narrow Lemaire Channel, could be one of the highlights of your voyage. Cliffs tower 700 metres straight up out of the ocean on either side of the ship. The water can be so still, that perfect reflections are mirrored on the surface and it is clear to see why this Channel is also known as Kodak Alley. Gigantic icebergs may clog the channel, creating navigational challenges for our captain and crew; occasionally they may even obstruct our passage. Located on Goudier Island, British Port Lockroy is an important site for both scientific research and visitors to the Antarctic continent. Designated a historic site in 1994 and opened to the Antarctic tourism industry in 1996, it was discovered in 1904 and used by the whaling industry in the first half of the 1900's. It was also part of the British Operation Tabarin during World War II, and was later used as a British Research Station. Today, Pork Lockroy is manned by the UK Antarctic Heritage Trust and operates as a museum, gift shop and Post Office for visitors from passing Antarctic expeditions. You can even send a postcard home from the Penguin Post Office, the World's most southern Post Office! Visiting Deception Island is like making a journey to the moon. We sail through the narrow opening of Neptune's Bellows to enter the flooded volcanic crater. The inside of the crater is an unworldly scene, virtually devoid of life. Glaciers flow down from the edge of the crater, littered with black volcanic ash. Located in Andvord Bay, Neko Harbour is an inlet home to Gentoo penguins and regularly welcomes Weddell seals. The scenery is dramatic - towering peaks and calving glaciers surround the harbour. The thundering crack of the glaciers as they calve, is sure to stop you in your tracks. There is no doubt that wherever your final itinerary takes you, you will leave Antarctica rich in memories and with a feeling of gratitude, having visited somewhere so beautiful and remote, where only a privileged few have set foot. As we approach Frei Base on King George Island, it is time to say farewell to Antarctica before boarding our flight to Punta Arenas, Chile. On arrival at Punta Arenas airport, you will be transferred to your downtown hotel. 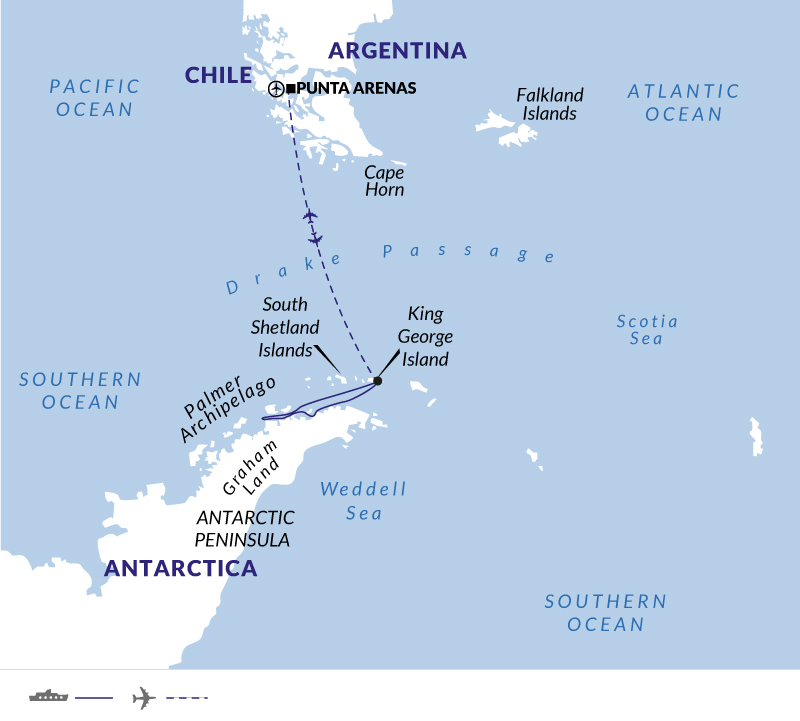 King George Island is located at the northern tip of the Antarctic Peninsula in the South Shetland Islands and is one of the most remote places on Earth. A clear sky with perfect visibility is required in order to take off and land safely. Please note, it is common to experience delays to your flight back to Punta Arenas. Bid a fond farewell to your fellow passengers after breakfast at the hotel and before continuing with onward travel. Argentina has a climate that ranges from subtropical in the north to cold in the temperate south. The Andes has erratic rainfall and flash floods from December to May. From June to September spring like sunny days temper the cold nights. Whilst landings are included in the cost of your trip as per the outline itinerary, some departures aboard the MV Greg Mortimer have additional optional excursions which can be pre-booked with the ship operator directly. These will be charged at an additional fee, depending on the excursion and we recommend booking these in advance to ensure availability. Please speak to a member of our Polar team who will advise you on the booking process. You should look for a lightweight, roomy, wind and water-resistant parka with some insulation. Bright colors are more visible - and thus safer - in polar environments. Keeping your hands warm and dry can be a challenge. Thin polypropylene gloves can be worn underneath warm outergloves. This allows you some protection from the cold when removing your gloves to operate your camera etc. We strongly recommend that you bring more than one pair of gloves, in case one gets wet (or lost). Warm, woollen hat/cap to protect your ears, as well as a scarf, neck gaiter or other face protection, such as a balaclava. Water-resistant trousers of coated nylon or, even better, Gore-Tex® are essential for your comfort. They can be worn over your regular clothes to keep you warm and dry. We suggest that you purchase trousers a few sizes larger than you normally wear as you will be wearing them over other clothing. Gore-Tex® or similar fabrics are excellent for keeping out wind and water without trapping excess heat. Rain gear and Gore-Tex® products can be found in any outdoor sport clothing store. In addition to your waterproof trousers, warm ski pants are suggested if you have them. Warm trousers such as jeans, corduroys etc are also good. Warm wool socks worn over a thin pair of silk, polypropylene socks should provide enough warmth and insulation for your feet. Bring several pairs of socks, since you will inevitably get your feet wet. Outer Clothing Woollen, knit or cotton sweaters/tops, polar fleece tops (medium weight), several cotton turtlenecks and T-shirts for layering on and off the ship. Thermal underwear is highly recommended as it will keep you warm without adding bulk. Most polar travellers prefer a lightweight version. Complimentary waterproof boots will be supplied on-board. However, if you have extra small or large feet, you are advised to bring your own. Also ensure you take good walking boots and trainers for relaxing. Please note that a 15kgs luggage weight limit is sporadically enforced on the internal flight to Ushuaia, occasionally charges may be levied against passengers taking luggage in excess of 15kgs. Tipping is of considerable significance to the people who will take care of you during your travels. It is an expression of satisfaction. The suggested amount is USD $10 - 12 per person per day spent on board. Of course, tipping is a personal choice and the suggested amount is set only as a guideline. Carry all your funds in US cash NOT Sterling or Travellers Cheques which are more difficult to exchange. We recommend to take a minimum of US$400-$500 of your total spending money in cash, in mixed denominations. Notes should be in good condition otherwise they might be difficult to exchange. You may wish to take extra cash as most optional excursions need to be paid in USD cash (not dispensed by ATMs in Argentina or Chile). The MV Greg Mortimer is a 104-metre ship, purpose-built in 2019 for expedition travel. Capable of negotiating the strongest winds and waves, the vessel is being built to world-class polar standards and has been designed in close consultation with expedition specialists. The MV Greg Mortimer is limited to just 120 passengers and guests can enjoy some added comforts such as spacious stateroom cabins, a large mud room with easy boarding access and a hydraulic viewing platform, offering unobstructed views of the wildlife. Other features include a library, Wellness Centre with a gym, sauna and spa and a multimedia room for keen photographers wishing to edit their photos after a day of exploration. As a modern and custom-designed ship, this vessel is at the cutting edge of nautical technology and will ensure a comfortable and safe passage through polar waters. The lead-in prices on our website are based on triple outward facing, Stateroom cabins. All staterooms have private bathrooms, ample storage, with twin beds. Many of the stateroom categories, have floor to ceiling windows that offer prime observation opportunities around the clock. Additionally, there are private balconies in most of the staterooms, allowing you to watch the world float past and take in the salty air of the open ocean. A full layout of the deck plan can be found under the Polar Ships section on our website. Your confirmed cabin type will appear on your Booking Confirmation, which will be sent on receipt of your deposit payment. Meals are served in the large, spacious dining room with an open seating arrangement, perfect for swapping stories with your extended expedition family. A range of courses is offered at each meal time and you can enjoy a variety of house wines, beers and soft drinks which are included with your evening meal. Complimentary coffee, tea and snacks are available throughout the day and any additional drinks can be purchased at the fully-stocked bar. All visa information is subject to change. You should confirm all visa related issues with the relevant Embassy prior to departure. USA (If flights transit): you will need to apply for an ESTA if you are transiting the USA as you will have to disembark and clear immigration before re-boarding for the onward flight. Citizens of the UK, New Zealand, Australia, Canada and passport holders from several EU countries can enter the United States without a visa under the Visa Waiver Program (VWP) - where you apply for an ESTA (Electronic System for Travel Authorisation), which applies if you enter the country by sea or by air. This must be done on line - https://esta.cbp.dhs.gov no later than 72 hours prior to travel. If you have visited Iraq, Syria, Iran or Sudan in the past five years or are dual nationals of these countries, you cannot travel under the Visa Waiver Programme. Instead you will need to apply for a visa from the nearest US Embassy or Consulate. If you are unable to provide a valid visa before boarding flights to the US, or entering via another method, you may not be permitted to travel. For further information please check out the US embassy website. Nothing compulsory, we recommend protection against typhoid, tetanus, polio and hepatitis A. Please consult your travel clinic for the latest advice on Malaria, Dengue and Zika Virus. Please take preventative measures to avoid mosquito bites - these include mosquito repellent as well as long trousers and long sleeve shirts to cover up when necessary. Please note many countries in Central America, South America and the Caribbean require a yellow fever vaccination certificates if travelling from infected areas. A detailed list of these countries can be found on the NaTHNaC website - http://travelhealthpro.org.uk/countries. Also on the NaTHNaC site there is a list of Countries (and specific areas within a country) which are at risk of infection and a vaccination is therefore recommended. Yellow fever is only recommended for those travelling to Iguazu falls. Please check the latest requirements with your travel clinic or doctor prior to departure. The above is not an exhaustive list. Further information regarding vaccinations and travel health advice can be found by following the NHS and NaTHNaC links at Explore Travel Health and from your local healthcare provider. Visa and vaccination requirements are subject to change and should be confirmed by you before travelling. Information No tranfsers are included on the final day of your itinerary, please advise if you would like us to arrange these for you in addition. Check-out from your hotel will be after breakfast on this day. Information A transfer to downtown Ushuaia or the airport is provided, depending on onward arrangements. Please note, we do not recommend booking flights departing Ushuaia prior to 12.00 pm on the day of disembarkation, in case there are any delays coming back into port. Information No tranfsers are included on the final day of your itinerary, you will need to make seperate arrangements for any further transport on Day 13 of your itinerary. Check-out from your hotel will be after breakfast on this day. Information No tranfsers are included on the final day of your itinerary, please advise if you would like us to book transfers for you on this day. Check-out from your hotel will be after breakfast. Information No transfers are included on the final day of your itinerary, please advise if you would like us to book something for you in addition. Check-out from your hotel will be after breakfast on this day.